Ah yes, Fair Use. The term is so misunderstood. That is easy to do because the guidelines for it are vague except when they are not. Well, fear not Bunky, help is at your command. 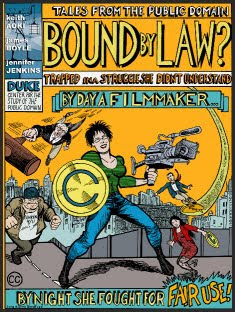 Duke University's Center for Public Domain has a free comic book that will help take the legalese and transform it in to plain functional English. Under the disguise of a mild mannered comic this is an introduction for videobloggers, documentary filmmakers, artists and anyone else who wants to be respectful of copyright but also needs to use representations and concepts of existing content. You can view the comic as a Flash animation, download a .pdf or using old skool HTML to view online. If you have that burning desire to mash up copyrighted material with your video content you have to make sure you understand what rights you do and don't have using other creator's content.